Hey hey hey, friends! This week has completely gotten ahead of me. As you're reading this we are on our way to California for a kid free vacation! We land there at 10am! 🙌 There's no doubt about it that we are so excited, but I totally underestimated how much there is to do before leaving your little ones. I swear...I've been "preparing" to leave for the past week, and I've written way too many mom notes! I thought that since I wouldn't have to pack a million and one kid clothes, wipes, diapers, etc. etc. that getting ready to leave would be much simpler, but HA, no. Don't get me wrong, we're so thankful our families will be watching the boys so we can get away but it's still A LOT. Happy to say that as I'm typing this things are all in place, the house is stocked with groceries, and we're ready to head to wine country. 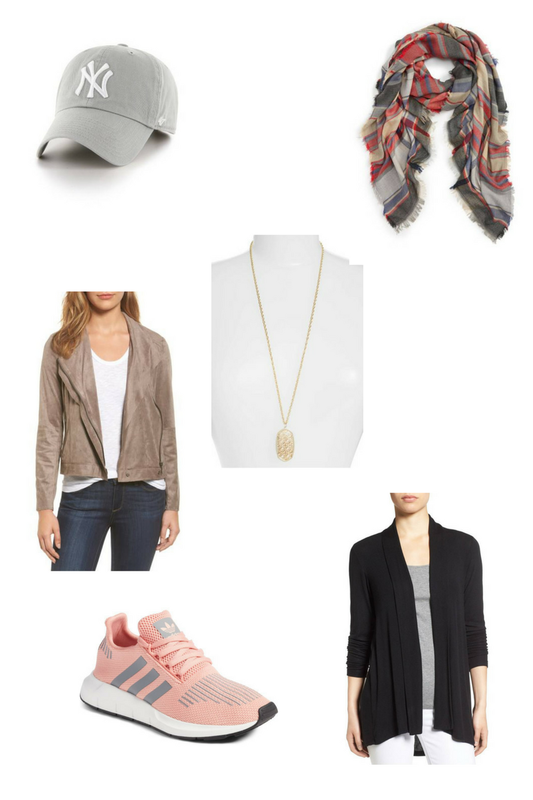 Cozy, neutral cardigan: Throw it on the plane or if you're cold walking around at night. This one doesn't disappoint either. Lightweight jacket: I have ALL the heart eyes for this jacket! Wear it over a dress or at night with some skinny jeans and a cute lace top. Statement necklace: Simple and versatile enough to wear with multiple outfits! A scarf: To wear on the plane that can double as a blanket or to dress up a casual outfit. This one happens to only be $22 and is perfect for fall!